I know summer in Toronto is short, and we want to take advantage of the limited warmth and sunshine. 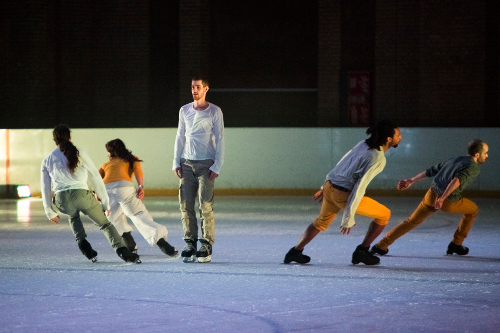 But I can’t think of a better way to spend a couple hours this June weekend than inside an ice rink watching Vertical Influences, a contemporary dance performance on ice being presented as part of Luminato. Vertical Influences is performed by Le Patin Libre, a collective of mostly former high-level figure skaters based in Montreal. But this is no Ice Capades full of sequins and sparkle. These dancers wear baggy jeans and street clothes and sport beards, ponytails and dreadlocks. The performance unfolds in two parts. During the first half, the audience is seated in the stands. (The show I saw was at Ryerson’s Mattamy Athletic Centre. There are also shows at the Don Montgomery Arena in Scarborough). The group of four men and one woman enter the ice moving as a group. First running, then gliding with increasing speed around and around the rink in unison. Individual performers break out and rebel periodically in solo bursts of edgy movement. Sometimes there are traditional figure skating jumps and spins, but always with a contemporary and unique twist. There are also elements of street dance as they feed off each other’s energy, sometimes literally sending another performer flying across the ice. I found it beautiful and mesmerizing. For the second half of the show, the audience moved down to ice level and was seated on cushions, benches and chairs at one end of the rink. I loved this part even more than the first half. Over and over the skaters would come out of the darkness and glide towards the audience at full speed, stopping inches from where I was sitting. You can feel the air moving around them and the ice spraying off their blades. The lighting adds to the mystery as the skaters move in and out of the shadows and fog. It’s an intimate and magical perspective from which to watch. The music is mainly percussive electronic beats (composed by skater Jasmin Bovin). I really enjoyed how the rhythm of the skates on the ice combined with the music and added to the sound design. Sometimes it was just the scraping of blades. Sometimes it was another beat, like tap or step dancing. The effect was strangely compelling and almost meditative. A few practical details — it is cold in the arena, so wear long pants and bring a sweater and maybe even a blanket. There is general seating and not a bad seat in the house. For the second half, I chose sit up front on the cushions, which I’d recommend if you are able. I think it added a level of immediacy which I found thrilling. Don’t miss this unique evening of movement on ice. I am not a very good skater myself, but Vertical Influences made me want to lace up and practice, even in June. Vertical Influences is playing as part of Luminato until June 25, 2017. Photo of Taylor Dilley, Pascale Jodoin, Jasmin Boivin, Samory Ba, and Alexandre Hamel by Alice Clark.